Review: I enjoyed listening to the prose of this novel, which is filled with evocative descriptions of the Essex landscape and insightful turns of phrase. Perry captures the atmosphere of Victorian science and culture including the fossils catalogued by Mary Anning and the medical discoveries of the time. I did not find the story itself to be a page turner though and it was easy to step away from this audiobook and start listening again later in the day. The characters were also not especially memorable. Beautiful writing and interesting historical context but the events of the novel made little impression. The audiobook is well read by Juanita McMahon. Review: An engaging coming of age novel set in the early 20th century that includes the social issues of the times such as the obstacles faced by women and immigrants, child labour and orphan trains. The novel is structured as a grandmother telling her life story to her granddaughter and therefore works especially well in the audiobook format. The main character, Addy Baum, tells interesting stories of her life and highlights the social change that has taken place over the course of the 20th century but she seems to overcome obstacles relatively easily and I was surprised that she was able to achieve her personal and professional goals in such a straightforward manner. The novel would have been more interesting if the narrator had faced more complicated challenges during her youth. If one of her sisters had been the central character, the tone of the novel would have been very different. A good read but the novel would have been more compelling with a less predictable storyline. Review: The first installment in Patrick O’Brian’s Aubrey&Maturin series set during the Napoleonic Wars. The novel is rich in historical detail and includes brief appearances by historical figures. Aubrey describes the Duke of Clarence (the future King William IV), who was a sea captain by the age of 21 as “that singularly unattractive, hot-headed, cold-hearted, bullying Hanoverian.” Hester Maria Elphinstone, Viscountess Keith, nicknamed “Queeney” is presented as a childhood friend of Aubrey whom he remembers with admiration. The nautical setting is beautifully rendered and gives a real sense of what it was like to be on a British naval vessel in the early 19th century. The story sometimes gets lost in all the nautical detail, however, and the novel is more difficult to follow than, for example, the first installment in C.S. Forester’s Horatio Hornblower series. The audiobook is well read by Patrick Tull. Review: The fascinating early life of Empress Elisabeth of Austria is reduced to a generic romance in this historical novel. There are a few details that suggest the setting such as the beer and bratwurst in Bavaria and references to the Alps and schnitzel in Austria but the famous palaces of the Hofburg and the Schonnbrunn in Vienna are not described in any detail. Only the final chapters engage in depth with the events of the time such as the Austro-Prussian War or Hungarian demands for autonomy. Most of the book is focused on Elisabeth’s feelings for Emperor Franz Joseph and her conflict with her mother-in-law with the occasional pause for a diplomat to explain the eastern question or Archduchess Sophie to discuss Habsburg geneology. The book would have been more interesting if the historical context was integrated into all aspects of the story and informed the personal decisions of the characters to a greater degree. There is also little evidence of Elisabeth’s unique personality and interests until the final quarter of the book. Instead, she spends her courtship blushing and her marriage grinding her teeth. Only after an extended separation during her marriage does she take control over own image and devote more time to her interests including poetry and fashion. A passable novel that could have been much better considering the interesting historical figures and political turmoil of the 19th century Habsburg Empire. Review: A heartwarming novel about an American journalist in London during the Second World War, inspired by the author’s grandmother. Robson holds a PhD in British economic and social history from Oxford and her in depth research, including interviews with British women who lived through the war, informs the novel. Goodnight From London is filled with fascinating historical details about London in the 1940s including fashions, food, office culture and the Blitz with an emphasis on the cultural differences between the United Kingdom and United States at the time. The characters are likable and there are some interesting developments in the plot as their backstories are slowly revealed. 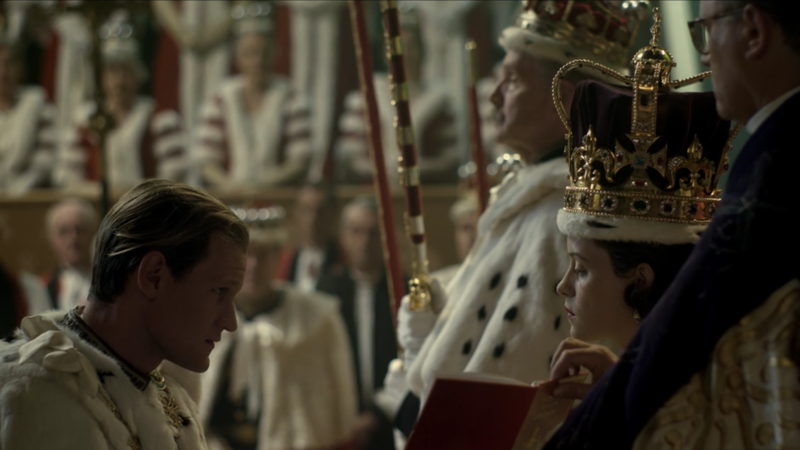 While most of the characters are fictional, there are a some memorable scenes featuring Eleanor Roosevelt, and King George VI and Queen Elizabeth make a cameo appearance toward the end of the novel. Recommended for readers of history and historical fiction. Review: The second book in the Maisie Dobbs mystery series focuses on a missing woman and a series of mysterious deaths. The mystery is set in 1930 but like the first book in the series, the focus is the lingering trauma caused by the First World War on British society. As Maisie’s former employer Lady Rowan observes, “That’s one more thing that I detest about war. It’s not over when it ends. Of course, it seems like everyone’s pally again, what with the agreements, the international accords and contracts and so on. But it still lives inside the living, doesn’t it?” Winspear’s novels are filled with historical detail and Birds of a Feather devotes particular attention to women’s roles both during wartime and afterward. I look forward to reading more of the series. Review: An enjoyable novel about the actress Marlene Dietrich from her childhood to the end of the Second World War. The opening and closing chapters are especially well done. The novel begins with the young “Lena” living in genteel poverty. Her mother was from a distinguished family but obliged to become a housekeeper during her widowhood, remarrying a lieutenant in Kaiser Wilhelm II’s grenadiers during the First World War. Dietrich is determined to transcend the social conventions enforced by her mother and forge her own career as an actress. The final chapters focus on Dietrich’s work for the USO during the Second World War and her estrangement from her sister, who made very different choices in war time. In between the world wars, there is a strong focus on Dietrich’s personal life, which becomes repetitive at times, but Gortner’s depiction of the cultural life of Weimar Germany then Hollywood is interesting throughout the book. An engaging read. Review: An epic historical novel that follows the history of Israel from prehistoric times until the 1960s. The structure of the novel follows the fourteen layers of an archeological dig and the stories behind the artifacts found there. The role of Judaism in structuring society over the centuries and the successive waves of military conflict and displacement in the region are dramatized in detail. While the setting comes alive in the novel, the characterization is sometimes repetitive. The novel contains many examples of men who do not feel that they fit into their society and their long suffering but loyal wives. Since the book was published in 1965, some material and perspectives are rather dated. The audiobook narrator reads very slowly and clearly and it’s therefore possible to listen at 1.25 times the usual audiobook speed and still enjoy the story at a reasonable pace. Review: A beautiful and moving Iliad inspired novel from the perspective of Patroclus, Achilles’s closest companion. The love story in the midst of the Trojan war is well developed. The characters are engaging including the clever Odysseus and the resourceful Briseis, who develops a close friendship with Patroclus. There is a good balance between myth and magical realism with goddesses and centaurs woven into the fabric of everyday life in Greece and Troy. The audiobook is well read, especially the rasping voice of Achilles’s mother. Highly recommended! Review: Classic historical fiction written in the form of Emperor Claudius’s memoirs of his path to the throne. Claudius is a charming, engaging narrator, conscious that he is writing for posterity. His childhood health problems, including a limp and speech impediment, result in him being underestimated by his family, especially his formidable grandmother Livia. Claudius receives advice that the perception that he is not a viable potential Emperor might keep him safe during periods of palace intrigue and he carefully navigates the conflicts within his extended family. In contrast to his ambitious relatives, Claudius is more interested in scholarly pursuits such researching and writing history even in face of scepticism about his abilities and doubts that his work will ever be read. This historical perspective allows more background information about Claudius’s extended family that would be expected in a straightforward fictional memoir. I, Claudius is best enjoyed with Claudius’s family tree close at hand as there is an enormous cast of characters connected to one another through complicated geneologies and marriages. Review: The first page or two of this novel were underwhelming for me. I could not imagine Penelope using the word “factoids” or explaining her life story after her death, thousands of years after the events of The Odyssey. Once I finished the first chapter, however, I found the book difficult to put down. Atwood’s retelling of the life of Penelope and her twelve doomed maids is original, tragic and darkly funny. The characters come to life including Helen of Troy (“Why is it that really beautiful people think everyone else in the world exists merely for their amusement?”) and Telemachus (“I’m sorry to say he was quite spoiled.”) I also liked the blend of different writing styles that brought the maids to life before their untimely deaths. Highly recommended. Review: An absorbing novel about Queen Cleopatra VII’s little known sisters Berenice and Arsinoe and the decline of the Ptolemaic dynasty in Egypt. The perspective alternates between Berenice, who supplants her father as ruler and is determined to maintain Egypt’s independence from Rome, and her half sister Arsinoe who is the overlooked middle child, ignored during the struggles for power within her family. There is a strong focus on the challenges faced by women of all social backgrounds at the time, including queens. The novel ends fairly abruptly and I look forward to reading the next book in the Fall of Egypt series, The Drowning King. Review: A historical novel inspired by Virgil’s Aeneid told from the perspective of Lavinia, the last wife of Aeneas and ancestor of the Romans. In the Aeneid, Lavinia is barely mentioned and is certainly overshadowed by other female characters such as Queen Dido of Carthage. In Le Guin’s novel, Lavinia is depicted as both a fully realized figure of great political significance in the prehistoric world of “the Latins” and a literary creation who speaks with the spectre of the future poet Virgil. Lavinia believes that the Aeneid ended too abruptly and that if Virgil had lived longer and continued the epic, her true deeds and character would have become well known. Lavinia is an engaging narrator and the writing is richly detailed but the plot sometimes moves slowly. Well written but not necessarily a page turner. Review: The second novel in Sharon Kay Penman’s medieval mystery series. I prefer Penman’s longer novels based on historical figures, especially the Welsh trilogy, but her medieval mysteries are enjoyable to read and make good use of the 12th century English setting. In the first novel, The Queen’s Man, written documents emerged as clues, creating complications in a society with widespread illiteracy. In Cruel as the Grave, switching language back and forth from Norman French (the language of the court) to English (the language of ordinary people) becomes a means of preventing conversations from being understood and overheard. 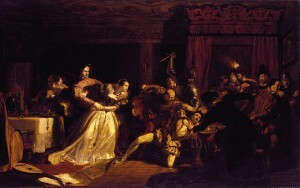 Justin de Quincy’s role as Eleanor of Aquitaine’s secret agent is overshadowed in Cruel as the Grave (except when he is sneaking into Windsor Castle to deliver clandestine messages) by his involvement in a tragic murder mystery involving prosperous merchant families and a Welsh peddler’s daughter. The mystery unfolds step by step until the final pages but the conclusion is not entirely surprising. Just the same, I look forward to reading the rest of the series. Review: The historical novels of Jean Plaidy (another one of her pen names was Victoria Holt) are always enjoyable vacation reads, informed by primary sources and filled with period details, engaging dialogue and memorable characters. My Enemy the Queen examines the rivalry between Queen Elizabeth I and her Boleyn cousin Lettice Knollys as they were both attracted to Robert Dudley, Earl of Leicester. None of the major characters are especially likable – Robert Dudley is portrayed as charismatic but dangerous, Elizabeth I is vain and self centered and Lettice is impulsive and governed by her passions. The novel is nevertheless a page turner and especially enjoyable for readers who have also read Margaret George’s recent novel about Elizabeth and Lettice. Review: I love Alexander McCall Smith’s Number 1 Ladies’ Detective Agency series and enjoy his Scottish novels but I did not find his foray into historical fiction, La’s Orchestra Saves the World, to be as compelling as his other books. There are some interesting philosophical passages about the Second World War and a nice message about daily life and small pleasures continuing to take place in difficult times but there was little of the subtle humor that appears in other McCall Smith novels. The characters also failed to come to life and seemed similar to those in other McCall Smith novels. La contemplates the meaning of education and her career prospects as a woman, similar to the heroine of The Forever Girl, and her husband is a wine merchant, one of the short lived career ambitions of Bruce from the 44 Scotland Street series. A breezy read but not as good as McCall Smith’s other novels. Review: An epic historical novel that encompasses Poland as the battleground of Europe from the Mongol Invasions of the 13th century to the Soviet backed Polish People’s Republic in the 20th century. Michener includes aspects of Polish culture including pierogies and the mazurka as well as the horsemanship of the landed elites. Michener places three fictional families at the centre of historical events: the aristocratic Lubonskis, the petty gentry Bukowskis and the peasant Buks. In the early chapters, the different generations of each family remain relatively unchanged but the characters come into focus as distinct individuals in the late 19th century as the Buks discover an opportunity to become small landowners themselves then all of the families experience the horrors of the Second World War. I disagreed with a few of the narrator’s statements, including an exceptionally negative assessment of Empress Elizabeth of Austria, but otherwise enjoyed the novel. Review: A beautiful short historical novel from the perspective of Mary during the early years of Christianity. Toibin imagines Mary as an elderly woman reminiscing about her son and frustrating the writers of the Gospels with her complicated perspective on her son’s miracles and crucifixion. The audiobook is a stellar performance by Meryl Streep, which presents the novel as an extended monologue by a revered elder who is eager to unravel her own story from the emerging New Testament. Highly recommended. Review: I have read The Odyssey on a few occasions but this is the first time I have experienced The Iliad from start to finish. The Iliad is filled with impressive speeches and vivid battle scenes. The conversations between Hector and his wife Andromache are quite touching. Of the two works attributed to the Homer, however, I prefer The Odyssey as Odysseus has a wide variety of adventures on his journey home while the battle scenes at the Siege of Troy, and the cycle of feasting and fighting, grow repetitive over the course of The Iliad. As epic poetry, The Iliad suits the audiobook format. Dan Stevens (Matthew Crawley from Downton Abbey) reads with enthusiasm but a little too quickly as the connections between the characters are important to the story and it is important that listeners do not miss them. The Robert Fitzgerald translation is excellent and brings the story to life. Review: An absorbing beach read. Beatrice Lacey, an eighteenth century gentlewoman who resembles Scarlett O’Hara from Gone with the Wind and Ashton from John Jakes’ North and South, is obsessed with controlling her family’s Wideacre estate and ruins the lives of everyone in the novel, including herself, in order to do so. The plot is completely over the top but Gregory has written the novel as a page turner, with a looming threat just beyond the boundaries of the estate that maintains the momentum of the story to the very end. There are some plotlines specific to the 18th century, such as the enclosure of common lands on landed estates, but otherwise, this is a historical novel that could have been set in a variety of time periods as the focus is on the scandalous behaviour at Wideacre rather than the wider world. Week 22: Fun Novels and Unexpected Royal References: Over the course of year, I have read more non-fiction than fiction. Where there have been novels on my reading list, they have mostly been historical fiction, dramatizing the lives of historical kings and queens. In the past few weeks, I have attempted to introduce more of a balance by reading fun novels that are not about royalty, at least on the surface. I discovered that there are often royal references in the most unexpected places. Billy Lynn’s Long Halftime Walk by Ben Fountain references a state dinner to the United States by Charles and Camilla where one of the attendees discovered common ground with the royal couple by talking about hunting and shooting. A would-be Russian Revolutionary in The 100-Year-Old Man Who Climbed Out the Window and Disappeared by Jonas Jonasson loses interest in his cause because he begins to empathize with Czar Nicholas II who was having “a spell of bad luck” that lasted until the very end of his life. Review: My book club selected this novel for the month of June. An enjoyable satire of American culture, especially celebrity worship. There are also some very funny scenes set in country clubs and corporate boxes that give a sense of the complicated attitudes toward the military in the United States, informed by social class, as the Bravos encounter numerous well wishers who just not sure what to say to them. Although the book is set more than a decade ago, the cultural references are surprisingly current with the characters excited about the possibility of meeting Beyonce and conversations about Charles and Camilla visiting the United States and dining at the White House. An engaging read. Review: A novel about a dysfunctional American family preparing for the wedding of their beautiful, wealthy, charitable half-sister at an English country estate. The perspective rotates among the major characters but the tone is consistently snarky and cynical. Some scenes are quite funny but the narrative also drags in places and it seems to take too long for the family to arrive in Britain for the wedding festivities. The audiobook is well read by two different narrators, who are quite good at imitating English accents, making the scene where Alice runs up the room service bill at Claridge’s especially entertaining. A fun read that could have been even more entertaining with some careful editing. Review: I have made many efforts to read Tolkien’s work in the past because people I know have recommended it to me and I have seen the movies. This audiobook of The Hobbit is the first time that I have completed one of Tolkien’s novels. The narrator is very enthusiastic about the material and brings a lot of energy to the voices and singing. The audiobook is a relaxing listen except for the section where the dwarves are battling giant spiders and I increased the reading speed to get that section done as quickly as possible. I found the story fairly boring overall, however, and had difficultly telling the singing dwarves apart. There are too many descriptions of daily life on the road including all the walking and frequent hobbit mealtimes. There are some engaging scenes such as the exchange of riddles between Bilbo and Gollum and I respect Tolkien’s ability to create a fully realized fictional world but his work does not particularly appeal to me. Review: Robinson Crusoe was first published in 1719 and large sections of the book are either dull or painfully dated. Robinson’s patronizing attitude toward Friday is especially tiresome. The novel also shows little character development as Robinson’s views and outlook on the world seem to remain the same despite living for more than 25 years on a desert island. The scenes where Robinson Crusoe figures out how to survive on the island, including hunting, raft building and farming, however, are fascinating and have lasting cultural significance, informing subsequent novels from Swiss Family Robinson to The Martian. The novel is worth reading for it’s influence on cultural history and insights concerning the attitudes of early eighteenth century Britain. Review: I always enjoy Alexander McCall Smith’s novels and The World According to Bertie is an especially enjoyable contribution to the #44 Scotland Street series. Although Bertie, the saxophone playing gifted child and his overbearing mother are at the centre of the story, there is a whole cast of entertaining characters who are connected to each other in surprising ways including an art gallery owner with a good heart but poor fashion sense (distressed-oatmeal sweaters), a globe trotting anthropologist, a monarchist cafe owner who defends Prince Charles’s reputation and a modern day Jacobite who notes that the current Stuart candidate to the throne is German. I also like how McCall Smith includes bits of Edinburgh history and geography in the novel. Looking forward to reading the rest of the series! Review: A blend of romance and historical fiction about a fictional American heiress, aptly named Cora Cash, who meets and marries a mysterious Duke and gradually learns his secrets and the secrets of British high society. The future Edward VII, who admired American women, makes some appearances at English country house parties and plays a key role in diffusing a confrontation between Cora and an especially unpleasant character. There are a few scenes that are a bit over the top but so was the gilded age of the 1890s. While the novel is enjoyable to read and illustrates the differences between the British and American elites in the late nineteenth century, I would have liked more depth for the secondary characters. The confident Cora and her perceptive lady’s maid, Bertha, come alive but the Duke never really comes into focus until the rushed ending and Cora’s overbearing mother seems to fade from view as the novel progresses. A fun read but not especially memorable. Review: A quirky historical novel that features cameos by historical figures from Czar Nicholas II (“A spell of bad luck that lasted right up to the end.”) to Einstein to Kim Jong Il. The author has a dry sense of humour and the ability to present an over the top, almost farcical plot in an amusingly deadpan manner. The 100 year old man’s past, which intersects with key events in the 20th century, is juxtaposed with his modern day adventures escaping the nursing home. Entertaining, but I probably prefer The Girl Who Saved the King of Sweden on Jonasson’s novels as it has a more cohesive plotline and fewer characters to keep straight. The audiobook is well read by Steven Crossley. Review: I enjoy C. W. Gortner’s novels, especially The Last Queen, because he brings a fresh perspective to historical figures and events. Queen Isabella of Castile is an excellent subject for a historical novel because her life and reign were filled with dramatic circumstances and interesting personages. I enjoyed the first half of this book because Isabella’s path to throne was filled with danger and sudden changes in fortune, which provide the novel with dramatic momentum. In contrast, the second half of the novel moved very quickly through the establishment of the Spanish Inquisition, Isabella’s first meeting with Christopher Columbus and waging war against the Moors, leaving out other key events or mentioning them in passing. I thought Ferdinand was introduced too early as part of a fictional teenage romance. It would have been more compelling to have Isabella come of age and develop her own ideas without his influence before their marriage. While Ferdinand appears in the novel too early, Isabella’s intent to wage war against Granada emerges too late in the narrative, and appears to be Ferdinand’s idea, when it was in fact her intention from the time of her marriage as stated in the Marriage Conditions of 1469. The book ends abruptly, acting as a prequel to The Last Queen (a novel of Isabella’s daughter Queen Juana la Loca). An engaging read but I did not always agree with the author’s pacing and approach to dramatizing Isabella’s reign. Review: I Was Anastasia has a fascinating premise, following the story of the most famous Anastasia claimant backwards and the Russian Revolution and imprisonment of the Romanovs forwards, with the stories meeting in the cellar room in Ekaterinburg where the Imperial family was murdered by Bolsheviks in 1918. The chapters concerning the claimant are interesting as they reveal a broad range of colourful characters who become involved in her quest to be recognized as Anastasia including Rasputin’s daughter Maria, and a Romanov cousin, Princess Xenia, who became an Oyster Bay socialite after the revolution. The chapters concerning the actual Grand Duchess Anastasia and the imprisonment of the Romanovs in 1917 and 1918, however, contain numerous historical inaccuracies, which are infuriating for readers who have read extensively about Anastasia and her family. The author notes in her afterward that she is not particularly interested in royalty and considers Russian names confusing. These biases are evident in her portrayal of the Romanovs. There are violent scenes involving the Czar’s daughters prior to the murder of the Romanovs that did not actually take place but are presented as historical, even in the author’s afterward. If these scenes had been depicted as the claimant’s imaginings, which differ from the historical record, they might have made sense in the novel but as a dramatization of the actual Anastasia’s experiences, they are completely inaccurate and come across as gratuitous sensationalism. I Was Anastasia has an interesting structure and approach and would have been a much better novel if the author had focused entirely on the claimant and her imagined memories instead of providing an inaccurate and sensationalized portrayal of the imprisonment of the last Romanovs. Review: My favourite novel in Alison Weir’s 6 Tudor Queens series so far. Jane Seymour, Henry VIII’s third wife is presented as quiet and contemplative but not a passive figure, as she is often described. Her rise from country girl to maid of honour to queen consort unfolds amidst Tudor intrigue and an engaging cast of characters including the royal family, ladies-in-waiting, ambassadors, political figures and the ambitious Seymour family. The first two books in the series, which focused on Catherine of Aragon and Anne Boleyn respectively, sometimes became mired in the details of Henry VIII’s first divorce but Jane’s perspective provides a sense of how individual courtiers responded to these circumstances. Jane sometimes compromises her principles to maintain her family’s place in the Tudor court hierarchy and her experiences reflect the difficult choices made by many of her contemporaries at Henry VIII’s court as the king initiated religious and political upheaval. Weir provides a richly detailed narrative, contrasting Jane’s comparatively modest family home, where all the women of her family joined in the labour of kitchen and the herb garden, with the glittering Tudor court where established and rising families jostle for precedence. Jane Seymour: The Haunted Queen is an absorbing read and I am looking forward to the publication of the next novel in the series, Anna of Kleve, next year! Review: The Rani of Jhansi is an ideal subject for a historical novel, a female ruler with a dramatic life and times who deserves to be better known around the world. This novel is not about the Rani, however, but one of her female guards, Sita. A lot of the book is devoted to court intrigue, conflicts and friendships between the women in the Rani’s household and Sita’s concern for her family. The Indian Rebellion of 1857, where the Rani was one of the key leaders, goes by quickly in the last 70 pages of the novel. The book is engaging and readable but it seems like a missed opportunity to focus on the Rani and the Rebellion. Review: This book was recommended to me by one the students in the history of Imperial Spain course that I taught earlier this year. The novel is an absorbing murder mystery set in rural Aragon during the reign of King Philip II amidst the preparations for the royal wedding of the king’s daughter, the Infanta Catalina, to the Duke of Savoy. The novel is well researched and captures the atmosphere of the sixteenth century Spanish kingdoms when the Inquisition was scrutinizing the behavior of Conversos (descendants of Jewish people who had converted to Christianity) and Moriscos (Former Muslims and their descendants who converted to Christianity) for signs of their former religious practices. The mystery itself was less compelling for me than the setting and historical context but the author maintains a consistent pace and I was interested in Magistrate Mendoza’s investigation to the very end. The novel provides a sensitive and nuanced portrayal of King Philip II and I would have liked to have read more scenes set at the royal court. Review: A fun, farcical novel about a missing atomic bomb and a plot to kidnap the King of Sweden. The last six or seven chapters are especially funny as the calm King and anxious Prime Minister are kidnapped by an anarchist in 2007 (who has himself narrowly survived falling through a roof into a pillow distribution centre in a condemned building). The anarchist, and his much smarter identical twin brother who does not legally exist, have accidentally come into possession of a South African atomic bomb mailed in error to Sweden. Like the twin, the bomb also does not legally exist. At the centre of the novel are the twists and turns in the life of Nombeko, who goes from latrine emptier to jewel thief to the brains behind a nuclear facility to the king’s unlikely rescuer. The author provides an affectionate portrait of King Carl XVI Gustaf who is unflappable throughout the kidnapping (even fixing a tractor) and always has the common touch. An enjoyable and sometimes hilarious read. I look forward to reading other novels by this author. Review: “My dear, it is just busy people that have time for everything,” declares Lucia to describe her wide array of hobbies and interests including taking up yoga. A 1920s social satire set in a British resort town with lots of quirky characters. The novel was written in the aftermath of the Russian Revolutions of 1917 and Lucia uses over the top analogies about social disorder whenever there is a threat to her leadership of seaside society such as “Bolshevism was in the air!” A fun read but I prefer the recent BBC TV series. Review: I always enjoy David Sedaris’s essays, especially his reflections about his childhood, family, travel and learning languages. This collection is not as funny as the classic Me Talk Pretty One Day but it is more entertaining than the recent Theft by Finding. There is some Canadian content as Sedaris gives a reading at an Indigo bookstore in Toronto then makes a disastrous appearance at Costco, where he is ignored by passing shoppers. My favourite chapter was about Sedaris’s travels in Hawaii where the holiday exactly matches the brochure in contrast to Normandy, which is not as picturesque as he expects. I could have done without most of the opening chapter at the creepy British taxidermist shop though Sedaris’s observations about gift giving at the beginning of the book are very funny. I discussed my new book Raising Royalty: 1000 Years of Royal Parenting and some of my favorite royal books – fiction and non-fiction – with CBC books. The books I recommend include Our Queen by Robert Hardman, Monarchy and the End of Empire: The House of Windsor, the British Government, and the Postwar Commonwealth by Philip Murphy, Mrs Queen Takes the Train by William Kuhn, Abundance: A Novel of Marie Antoinette by Sena Jeter Naslund and The Winter Palace by Eva Stachniak. Royal History: Edward IV and Elizabeth Woodville: A True Romance by Amy Licence When King Edward IV of England announced to his council in 1464 that he had secretly married Elizabeth Woodville, his advisers responded “she was not, all things considered, a suitable wife for him, nor a woman of the kind who ought to belong to such a prince.” Elizabeth was not the wealthy foreign princess expected to become queen but the widow of a knight as well as the mother of two young sons. The unlikely royal romance has become part of popular culture, inspiring Philippa Gregory’s novel, The White Queen and a TV series of the same name. History: How To Be a Victorian: A Dawn to Dusk Guide to Victorian Life by Ruth Goodman Histories of the Victorian era often focus on the lives of the wealthy and powerful. Goodman is interested in the daily routines of ordinary people in nineteenth century England from the city clerks (whose offices were only heated to 10 degrees in the winter, if at all, necessitating heavier business suits than those worn today) to the farm labourers (who ate better meals in the north where potatoes and oatmeal were widely available than in the south where bread was the staple food). The book is structured as a day in the life for the average Victorian, from stepping out of bed onto a tiny homemade rug made from woven rags to washing dishes by gaslight after the evening meal. The princesses sent to these remote places also complained about their fate. In 1514, Isabella of Austria wrote to one of her sisters, “It is hard enough to marry a man…whom you do not know or love, and worse still to be required to leave home and kindred, and follow a stranger to the ends of the earth, without even being able to speak his language (Retha Warnicke, The Marrying of Anne of Cleves: Royal Protocol in Early Modern England , p. 3-4). Despite the shortcomings of dynastic marriage for both political stability and personal happiness, the practice continued into the nineteenth century and royalty were expected to marry other royalty until the First World War. In France and Spain, the exchange of princesses was a tradition that lasted from 1559 until 1739. Both Louis XIII and Louis XIV married princesses from the Spanish branch of the House of Habsburg and Louis XV seemed destined to also make a Spanish match. In The Exchange of Princesses , historian and novelist Chantal Thomas, author of the novel, Farewell, My Queen and scholarly study, The Wicked Queen: The Origins of the Myth of Marie-Antoinette dramatizes an early eighteenth century exchange of princesses between France and Spain and the unhappiness that followed for the young princes and princesses involved. Thomas excels at looking behind the glamorous facade of eighteenth century European royal courts. In Farewell, My Queen and the film based on the novel, Farewell My Queen / Les Adieux à la Reine , there were as many scenes set in the flea ridden servants’ quarters of Versailles as in Marie Antoinette’s elegant rooms at Petit Trianon. In The Exchange of Princesses , the princesses experience separation from their families, extreme discomfort traveling between France and Spain on muddy roads, unfamiliar customs when they reach their destinations and grotesque illnesses from measles to smallpox. The atmosphere of both courts and the eccentricities of the individual characters are vividly portrayed as neither match goes according to plan. The style of the novel is unusual. Thomas focuses closely on the two royal couples brought together by the The Exchange of Princesses : King Louis XV of France and Mariana Victoria of Spain and Luis I of Spain and Louise Élisabeth d’Orléans. Mariana Victoria is between the ages of four and seven over the course of the novel and Louise Élisabeth is gradually losing her mind and their perspectives therefore reflect extreme youth and mental illness respectively. Amidst the alternating stream of consciousness of these two princesses and the people who surround them are actual letters written by the historical figures involved in the The Exchange of Princesses , newspaper accounts from the period and the author’s own asides from her travels. While all this additional material provides interesting context and detail, it sometimes slows down the narrative and creates distance between the reader and the characters. In The Exchange of Princesses , Thomas brings alive a little known episode in the history of France and Spain that was one of the last of a series of exchanges of its kind. Both Mariana Victoria and Louise Élisabeth were sent to remote places and may well have been happier if they had been permitted to remain among their own people with less pompous display. 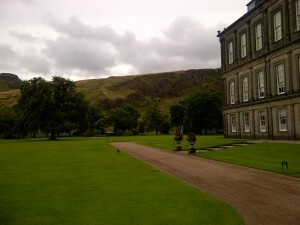 The Palace of Holyroodhouse in Edinburgh is Queen Elizabeth II’s official residence in Scotland. Every year, the Queen resides at the Castle for “Royal Week,” hosting garden parties on the Holyroodhouse grounds and inducting new members into the ancient Order of the Thistle. If Scotland votes to secede from the United Kingdom in September, the Queen’s successor may have a separate Scottish coronation at Edinburgh’s St. Giles Cathedral. 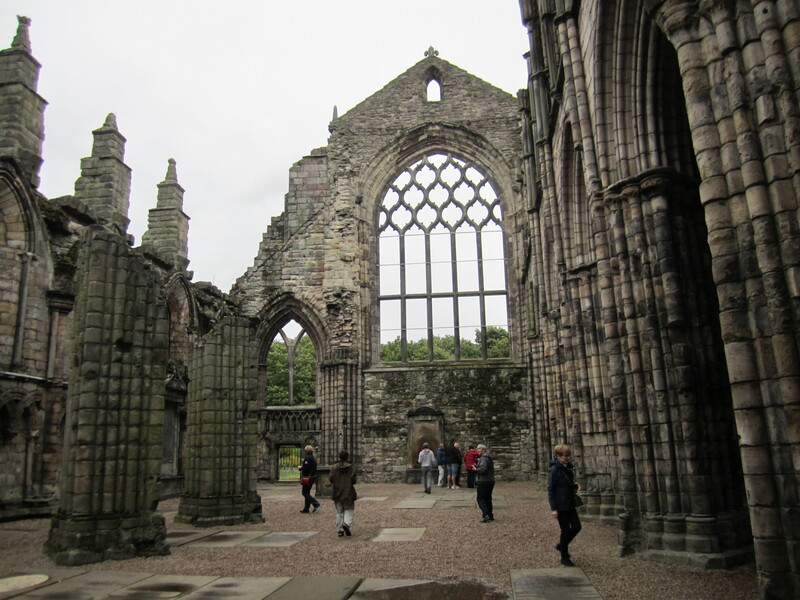 1) St. Margaret (1045-1093) Malcolm III’s queen, Margaret, chose Edinburgh as Scotland’s capital, persuading her husband to move his court there from Dunfermline. Margaret was renowned for her piety and education and transformed the Scottish court into a centre of learning. One of the holy relics in her possession was a fragment of the “holy rood” or true cross. In 1128, Margaret’s son, David I, founded Holyrood Abbey to house the relic. 2) Margaret Tudor (1489-1541) When James IV negotiated his marriage to Henry VII’s elder daughter, Margaret, he decided to transform to royal apartments at Holyrood Abbey into a Renaissance Palace between 1501 and 1505. James IV was well versed in history and spoke multiple languages. 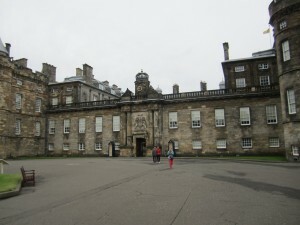 The construction of the Palace of Holyroodhouse was intended to impress the King’s English bride and proclaim to the world the Scottish court was the equal of other European royal establishments. 3) Mary, Queen of Scots (1542-1587) When Mary, Queen of Scots returned to Scotland from France in 1561 at the age of eighteen, she introduced French style decorations to her apartments in Holyroodhouse. 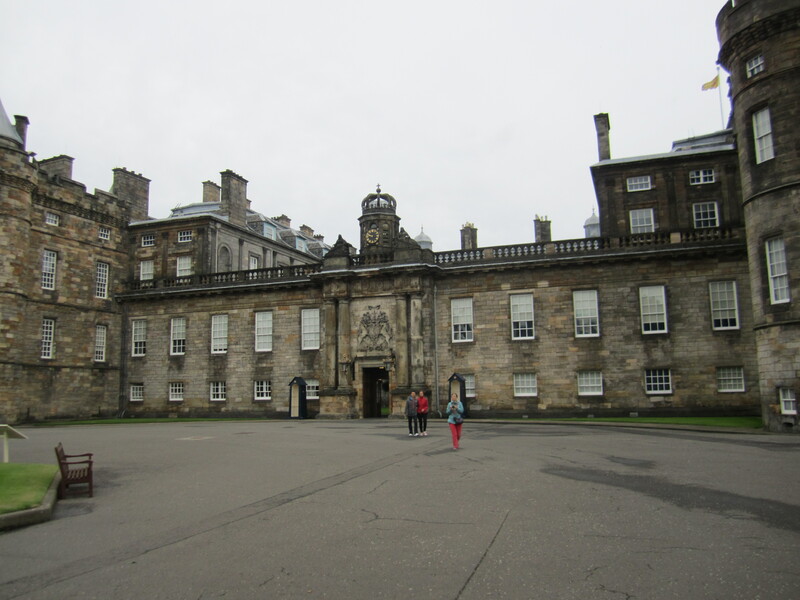 Mary spent her youth in France as the future wife of King Francois II and found Holyroodhouse shabby in comparison to the Louvre and the Chateaux of the Loire Valley. In 1566, a heavily pregnant Mary, Queen of Scots witnessed the murder of her secretary, David Rizzio, in her private apartments at Holyroodhouse by a faction of Scottish nobles led by her second husband, Lord Darnley. After the murder, Mary left Holyroodhouse and gave birth to the future King James VI of Scotland/James I of England at Edinburgh Castle. 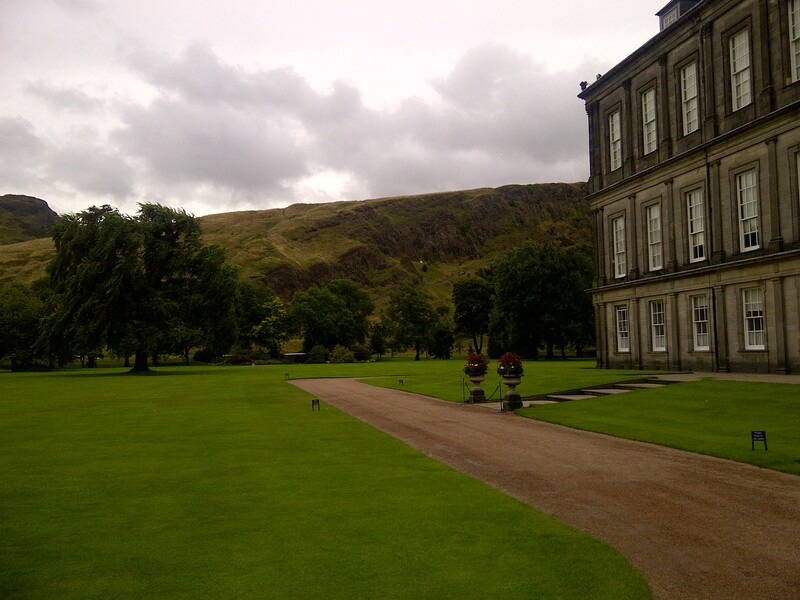 Holyroodhouse Gardens, where the Queen hosts Scottish garden parties today. 4) Catherine of Braganza (1638-1705) Charles II’s Portuguese queen, Catherine of Braganza, never visited the Palace of Holyroodhouse. Following the restoration of the English and Scottish monarchies in 1660, however, Charles II ordered extensive improvements to the palace for himself and his bride including new apartments for the queen. The King appointed architect Sir William Bruce to oversee additions to the palace including the modern quadrangle. Catherine also had a strong cultural impact on Britain – she popularized tea drinking at a time when coffee was the preferred beverage of the aristocracy. 5) Queen Victoria (1819-1901) Queen Victoria discovered Scottish culture through the novels of Sir Walter Scott and developed a strong affinity for Scotland. While her predecessors largely neglected Holyroodhouse, Victoria spent part of her year in Scotland, attending official engagements in Edinburgh and holidaying at her private residence, Balmoral. 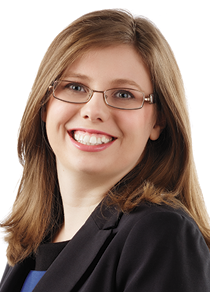 While in Scotland, Victoria immersed herself in Scottish culture, dressing her children in tartans, listening to readings of Robert Burns poems and even assuming a Scottish accent. The relationship between the monarchy and Scotland has remained close since Victoria’s reign.